You didn’t point out the cool pattern. 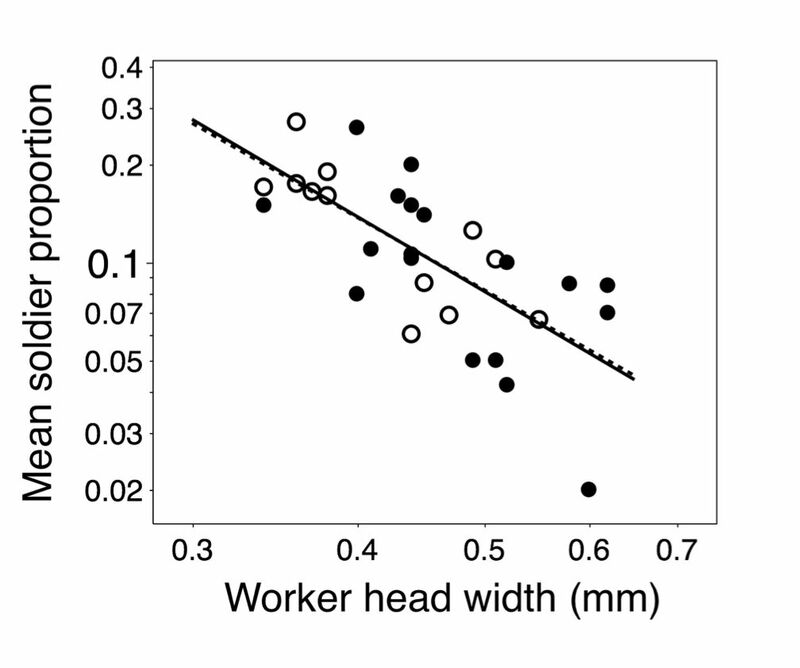 Is it that as ant colonies allocate more resources in soldiers, they invest less in minor workers(using head width as a proxy?)? Your talk at IUSSI was pretty awesome! GO social insects! Thanks for the rave review! (This figure, or a similar one, was from that talk.). I did link to the paper in PLoS One for the people who wanted the story. The take-home message, to me at least, is that colony-wide defensive investment is mostly a constraint based on body size, which isn’t flexible. Each species differs in its defensive allocation, which is controlled by a develpmental trigger based on body size. People have been trying to understand what controls colony-wide soldier production for a long time, and I’ve shown that it’s mostly a constraint and not really adaptive at all, at least at the colony or population levels.